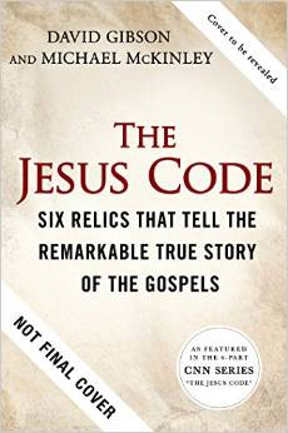 It is called The Jesus Code: Six Relics That Tell the Remarkable True Story of the Gospels. Of course, one of those relic is the Shroud of Turin. It is due out in February 2015, and you can pre-order it now at Amazon. The hardcover will sell for $20.24 and the Kindle edition for $12.99. There will also be an audio version which is a sure sign that the book is expected to be popular with high sales. As featured in the 6-part CNN SERIES "The Jesus Code"
THE JESUS CODE explores six major artifacts, including the Shroud of Turin, the True Cross, and the Holy Grail, that give us the most direct evidence about the life and world of Jesus. The book and attendant CNN series provide a dramatic way to retell "the greatest story ever told" while introducing a broad audience to the history, the latest controversies, and newest forensic science involved in sorting out facts from the fiction of would-be forgers and deceivers. The book and the show draw on experts from all over the world. Beyond the faithful, the book will appeal also to the skeptical and to curious readers of history and archaeology, while it takes viewers of the primetime TV series deeper into the story. With a fascinating, blockbuster subject, top-notch authors, and official CNN tie-in and support, we have tremendous opportunity to make THE JESUS CODE a bestseller and category classic. DAVID GIBSON is an award-winning religion journalist, author and filmmaker who specializes in covering the Catholic Church. He appears frequently on network and cable television as a commentator on religious affairs and is a frequent commentator on NPR. He has written and co-written three prior books and also writes for The New York Times, Wall Street Journal, New York Magazine, Boston Magazine, and Fortune among others. MICHAEL MCKINLEY is an award-winning author, filmmaker, journalist and screenwriter. He has written several books, and wrote and co-produced the CBC TV documentary film "Sacred Ballot", as well as several documentaries for CNN Presents. I wonder if this is the same CNN series that I was telephoned about two weeks ago to see if I could help with research. I was asked nothing about the Turin Shroud ( the producer I talked to did not even mention it) , they only wanted to hear about the True Cross and I was able to put them onto some recent scholarship on the fourth century legends of the True Cross. I think they are going to carbondate some wood supposed to be from the Cross. So someone must be helping them on the research for the Turin Shroud. In the gospel of John ; it tells the story of what Jesus had on him when he was placed in the tomb and what Simon Peter saw when he entered the tomb after his resurrection. Chapter 20 : 6 and 7 states that a small napkin or face cloth was about his head ; and Peter saw it separate on the floor away from the rest of the other linens; which the Jewish people would use strips of linen ; rather than a shroud. What is doubtful here is the “exploring the evidence of Jesus’ existence by questioning the authenticity of sacred relics.” The Jesus movement, which later became the Church, did not have relics as the basis of faith. Some of the members of the movement knew Jesus in the life, what they preached was the resurrected Jesus, without carrying relics in their handbags. How to Start a Rumor Matching Faces. Is it Possible?